Tunes & Tales started only in recent years, and has become immensely popular, turning the evenings into magic as characters in period costume, bluegrass musicians and storytellers celebrate the legacy of Appalachia and share it with all who care to gather ’round. Just to put an even bigger smile on your face, Zeno the Bear, Gatlinburg’s very own costumed character is usually around during these summer evenings – fun loving, street dancing, very furry, and always ready to give out hugs to children whose mothers have their cameras ready. See how far you can get in your stroll along Parkway, before you get caught up in a little cluster of people being entertained by demonstrations of fiddle and banjo, dulcimer and guitar, and the sweet sound of hill music. Don’t be surprised to see cloggers showing how it’s done, or to be spellbound by a story out of legend. If you’re tired of the stroll, take a trolley and, uh, troll? Maybe not, but either way, the trolleys are free in Gatlinburg for 40 special stops along Parkway, starting Saturday, June 13, 2015 and lasting through August 15. The trolleys are vividly painted to show they’re the free ones, and they run from 10 am to 10 pm, between Light #1 and Light #10. They’re open-air, perfect for hopping on and off and shooting the sights with your camera. The free trolley is a great way to dive in and see more in Gatlinburg, make a jaunt of it and have fun. It’s perfect for shopping and taking in many of the Parkway attractions you might not even have known about. For amazingly cheap prices you can travel to more than 100 destinations, including Pigeon Forge, Sevierville and parts of Great Smoky Mountains National Park. You can even go to Dollywood by trolley and if you do you’ll discover the third sure sign that summer has started. Coinciding with free Trolley season in Gatlinburg, Dollywood starts its Great American Summer season on June 13, 2015, lasting through August 2. During this season the park hours are longer, from 10 am to 10 pm, which opens some of the best rides up to thrills under the night sky. Every evening has a spectacular fireworks display, following the evening dance party. There are lasers, special effects, a Gazillion Bubbles, and plenty of high-energy fun things happening. 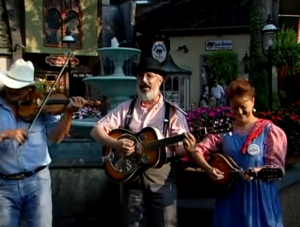 For more information see Dollywood’s Great American Summer website.